This year is D.C. Central Kitchen's 30th anniversary. But the local nonprofit that works to break the cycle of hunger and poverty isn't celebrating. Here's why. WASHINGTON — Four years ago, Earl Pass felt as if he was being followed. The D.C. resident was just released from prison after serving a 14-year sentence, and nearly everywhere he went — job fairs, his halfway house — Pass ran into representatives and recruiters from D.C. Central Kitchen. Taking it as a sign, and with encouragement from his son, he decided to enroll in the nonprofit’s fully funded, 14-week culinary job training program. Now, Pass spends his days making from-scratch breads and baked goods at D.C. Central Kitchen, where he works full time. He also mentors other students going through the same program. “I guess we never know our callings in life … It makes me feel proud of myself that I’m doing something positive, creative,” said Pass, 44. On Jan. 18, Pass stood in front of D.C. Council members and city leaders at the Wilson Building in downtown D.C., and shared the story of how he worked his way from incarceration to realization, thanks to a local organization that gave him a chance. Pass’ speech was part of a ceremony commemorating D.C. Central Kitchen’s 30th anniversary — just don’t call it a celebration. “Quite honestly, there’s not a whole lot to celebrate,” said D.C. Central Kitchen CEO Mike Curtin, Jr.
D.C. Central Kitchen was founded in 1989 by former nightclub manager Robert Egger, who was frustrated with traditional approaches to resolving hunger and homelessness. He wanted to provide D.C. residents with more than a meal. “What the kitchen was designed to do 30 years ago, and it still does today, is to look at hunger and charity through a different lens and try to get at the root causes of hunger, ultimately poverty, by using food not as an end, but as a means, as a tool to strengthen bodies, empower minds and build communities,” Curtin said. 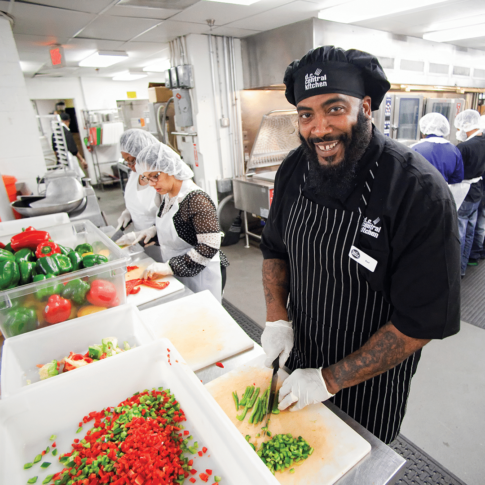 In addition to the culinary job training program, which equips unemployed, underemployed and previously incarcerated individuals with the skills they need to work in restaurants, hotels, hospitals and more, D.C. Central Kitchen hires its graduates to cook meals for the city’s homeless shelters and rehabilitation facilities, utilizing thousands of pounds of food that would otherwise go to waste. Its employees also make farm-to-table lunches for a number of D.C. schools, and deliver fresh produce and healthy snacks to corner stores in the city’s food desserts. “The more important number is the 1,800 men and women that have gone through our training program, that have gone from a place of dependency and relying on those handouts to a place where they have jobs, where they’re supporting themselves, where they’re supporting their families, where they’re contributing to this community and ultimately breaking that cycle of hunger and poverty,” he said. Since 1989, D.C. has gone through some pretty drastic changes, and not everyone has reaped the benefits of its economic boom. In fact, Curtin said the nation’s capital has “some of the most unfortunate statistics” when it comes to food insecurity and childhood hunger. According to data from Feeding America, more than 78,000 people living in the District lack consistent access to food. Even still, Curtin said there have been happy moments over the years, including a few visits from President Obama and his family, and the 100th culinary job training graduation, held in 2015. “To recognize that kind of longevity and have that many people be part of that accomplishment was mind blowing,” Curtin said. Little victories also stand out, like the time the staff figured out how to use a tilt skillet to make pancakes and delivered a hot breakfast to the shelters. Then there’s the snowy day in 2010 (also known as Snowmageddon) when volunteers shoveled out the kitchen’s delivery trucks, so no meals were missed. “That was a pretty incredible day,” Curtin said. And not to go missed is the hope D.C. Central Kitchen supplies every day. Pass said he wakes up excited to go to work, but one day, he’d like to own his own business. “I just want to stay focused and just hope that you all can come in some day and I’ll serve you all in my restaurant. That would be amazing, so I’m going to try,” Pass said. But for Curtin, the work of D.C. Central Kitchen isn’t done until the anniversaries stop.